Check out the December 22, 2015 update on Wintering Whooping Crane’s, by Dr. Wade Harrell, U.S. Whooping Crane Recovery Coordinator. Wade Harrell, U.S. Whooping Crane Recovery Coordinator provided us with this update. 308 Whooping Cranes at Aransas. An additional 6 birds were observed outside the survey area indicating that the Aransas/Wood Buffalo Flock may have as many as 314 individuals – see the latest News Release from the United States Fish and Wildlife Service. 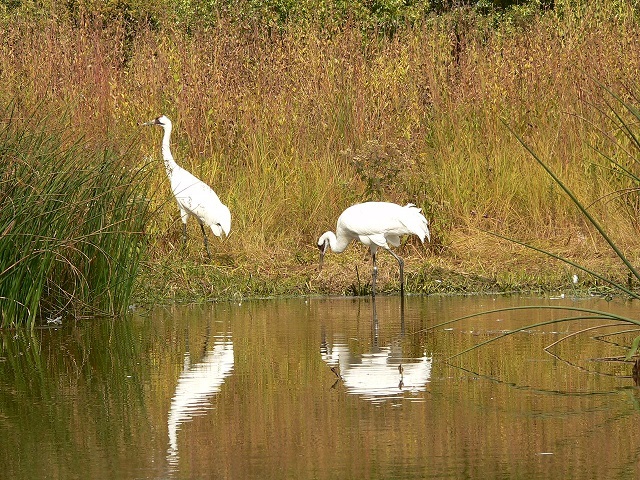 The Whooping Crane Conservation Association is currently seeking interested people to fill upcoming vacancies on our Executive. All executive positions, including those of the Trustees, are volunteer positions with no remuneration. We are seeking a person with organizational skills who is interested in becoming the secretary of the WCCA. The secretary is reponsible for keeping track of the membership information and donations. Proficiency with Microsoft ACCESS an asset. We are seeking a person with writing and organizational skills to put together our newsletter “Grus Americana”. The editor assembles articles of significance and then uses word processing software to form a newsletter. Proficiency with Microsoft Word or other word processing software an asset. If you are interested in either of these positions, please use the Contact WCCA page. Thanks for your interest. Wade Harrell, U.S. Whooping Crane Recovery Coordinator. It continues to look like a banner year in terms of habitat conditions, with the Refuge having a greater amount of freshwater on the landscape than we have seen in several years. Fall and winter rains are slowly moving us in the right direction. Whooping Cranes have responded to these conditions by spending more time in the coastal marsh, foraging on the relatively abundant blue crabs and other food resources. While we have still seen some Whooping Crane use of inland habitats this year, that trend is definitely down from the peak of the drought 2 seasons ago. Visitors to the Refuge and those observing Whooping Cranes from boat tours have been in a good position this year to observe use of the traditional coastal marsh habitat. We’ve had some outstanding weather lately, and I encourage everyone to come out and visit us before the Whooping Cranes start heading back North in late March. Many of you will be happy to know that we have reinitiated our Refuge bus tours for February and March. Tours are first-come, first-served, and visitors must register in the visitor center the day of the tour. Thursday, 1:00 – 3:00 p.m.
Friday, 1:00 – 3:00 p.m.
Saturday, 10:00 a.m. – 12:00 p.m. and 1:00 p.m. – 3:00 p.m.
Sunday, 10:00 a.m. – 12:00 p.m. and 1:00 p.m. – 3:00 p.m. The U.S. Fish & Wildlife Service and Texas Parks & Wildlife are seeking information about the death of a Whooping Crane. The carcass of the bird was found on January 4. For more information, please see the press release. We were able to fly some training surveys on January 5-6 with our new Refuge Biologist Keith Westlake and Ecological Services biologist Frank Weaver. We are still working through the best way to utilize GoPro Camera technology in our survey efforts, but have some clips of how things look 200 feet above the marsh. We’ll be uploading the survey clips on our Facebook page, so check it out in the coming week. Whooping Cranes outside the traditional wintering area that have been reported to Texas Whooper Watch include a single adult bird associated with a group of Sandhill Cranes in Eastern Williamson County, a pair of adult Whoopers near the town of Refugio, and a pair of adults with 2 juveniles in Northwest Matagorda County. The Refuge successfully conducted 3 burns this winter, 2 on the Blackjack Peninsula along East Shore Road (primary Whooping Crane habitat) and one on Matagorda Island. Total acreage burned was more than 12,000 acres. The first whooping cranes to return to the wintering grounds at the Aransas National Wildlife Refuge did so in mid September, about a month earlier than usual. 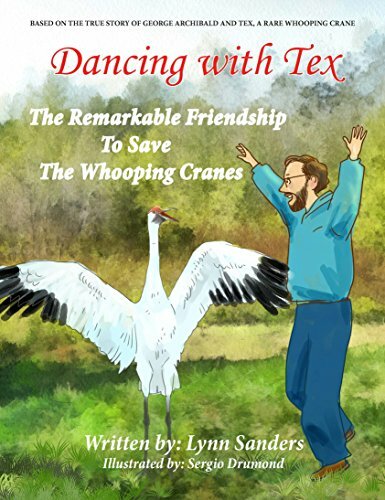 A children’s book by Lynn Sanders, based on a real life story of a man and a whooping crane. Shop at Amazon via the WCCA website and we receive a small commission that goes towards the running of this website. Grus Americana newsletters available on line. New Grus Americana newsletter available on line.